Today we have a special guest blog post from Aliza Sherman-Risdahl, author of “The Everything Blogging Book” which comes out July 31 and features When Tara Met Blog. Yup, I’m in the book! Anyway, back to Aliza, she is a Web pioneer, online marketing expert, published author, blogger and was named by Newsweek as one of the "Top 50 People Who Matter Most on the Internet." She has spoken around the world about the Internet, entrepreneurship, and women's empowerment. Go her! "I moved to New York City from North Carolina in 1987 with a shiny new job in the music business (a major international booking agency), an innocent mind, and tender lungs that seized up the minute I walked outside and inhaled the concentrated exhaust fumes of city living. I had a hacking cough my first six months in Manhattan, and then I got used to it. Like the way you quickly adapt to walking in the city – resisting the natural urge to look up in awe at the skyscrapers and instead, looking ahead with determination and intent, and with your purse locked under your arm. My first years in the City were full of parties, nightclubs and drinking copious amounts of alcohol where most nights blurred into days and days into nights, and I retained only slide-show memories of what had transpired in any given timeframe. Being in the music business meant being on the VIP guest list wherever I went, and to stretch already tight budgets, my girlfriends and I would hit the clubs early during happy hour when the open bar was flowing, since two-fisted drinking was our way of making the most of the perk. Other perks included rubbing elbows with rock star wannabes and rock stars of the time, from Kip Winger to Sebastian Bach to the guys from Def Leppard and Metallica and getting to watch concerts from the stage. One of my worst memories came after a dubiously successful two-fister evening where all I could remember was the cool white tile of the club bathroom floor, a bouncer carrying me to a cab, a friend helping me up the stairs to my apartment, and waking up still wearing my red mini skirt and crumpled top. Luckily, someone had been kind enough to remove my puke-splattered black cowboy boots and place them standing up beside my bed. And like every other hungover morning, I'd step out into the cruel, glaring sunlight to the shock of a million people streaming by my door and a million cars honking their horns. I'd press my sunglasses a little closer to my face and crawl down into the subway station for relief. Awesome guest post on the best blog in NYC. 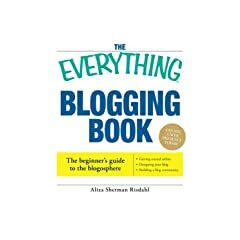 I will certainly be purchasing "The Everything Blogging Book" on the 31st! COOL! what do you say in the blogging book? I guess I'll have to read it LOL I'll be in a book coming out next year but it's not about blogging. CONGRATS!